For some reason, pinpointing “fall” colors is really difficult for me. Is bright orange a “fall” color? What about mauve or crimson? Do any of the flowers in the picture below fit the bill? I hope so! 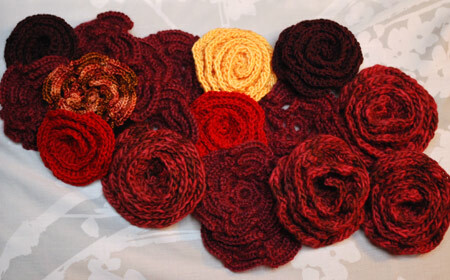 My friends asked for fall-colored knitted or crocheted flowers to use during their wedding, and I was happy to give it a go! All through the later summer and early fall, I excavated every autumnal leftover scrap of yarn, every fall-ish odd and end, and turned them into flowers. I used two patterns: the center of the American Beauty square from 200 Crochet Blocks (if you remember, I wanted to use something similar in the potholder swap), and Flared Rose from 100 Flowers to Knit & Crochet . The latter was a better choice for this project, I think – very pretty and three-dimensional, yet seriously mindless to make. 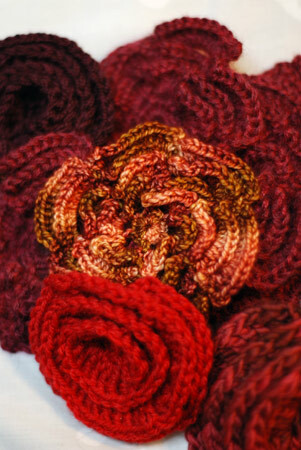 I would crochet the flared roses on the train on my way to work, before coffee! And here’s the canopy under which my friends got married, all decorated and gorgeous. I even spot flowers that I crocheted! Many happy years together, Amanda and Alasdair! very pretty- those flowers even tempt me to pick up a crochet hook again…. how beautiful! and what a wonderful way to start new married life, married under something handmade by those who love you. Wow, how fun! What a cool feel for a wedding, and how neat that you got to contribute! Those are definitely beautiful fall colors! Flowers are fun to knit, aren’t they? Yours turned out great. Very pretty flowers and what a wonderful ideas! Very totally fall I say. How Autumnally COOL! ~Love it..great job! Oh, they’re splendid! A lovely canopy indeed. I love fall. What a beautiful idea! Unique and lovely. I’ve never seen anything like it! The flowers are such a nice touch. Those are beautiful! What a great idea. Beautful. I could see a scarf made with loads of flowers! So pretty! I love roses. At first I thought you did one of those Nikky Epstein’s flower scarf. How beautiful! And what a wonderful gift for your friends! Beautiful! What a wonderful way to be a part of your friends’ wedding. I think all the colors you used are fall colors, I might have even added some greens, not bright springy greens tho. I like the canopy – very original idea. Around here, any wedding decorations other than silk/polyester or real flowers would be out of the ordinary! Those flowers are gorgeous! What a great idea. How beautiful! 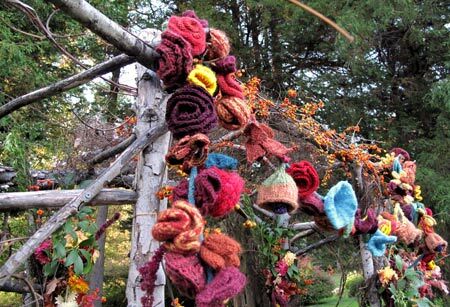 I like the idea of a knitted garland. I’ll have to start brainstorming for the holidays. What a great idea! Beautiful job! I discovered this weekend that there’s a tree I can see from my couch that is bright orange (with a vibrant yellow center). Apparently bright orange is a fall color. Oh wow! That is the best idea! Your flowers are so pretty. What a great way to involve friends in your wedding! It makes for a lasting flower arrangement.